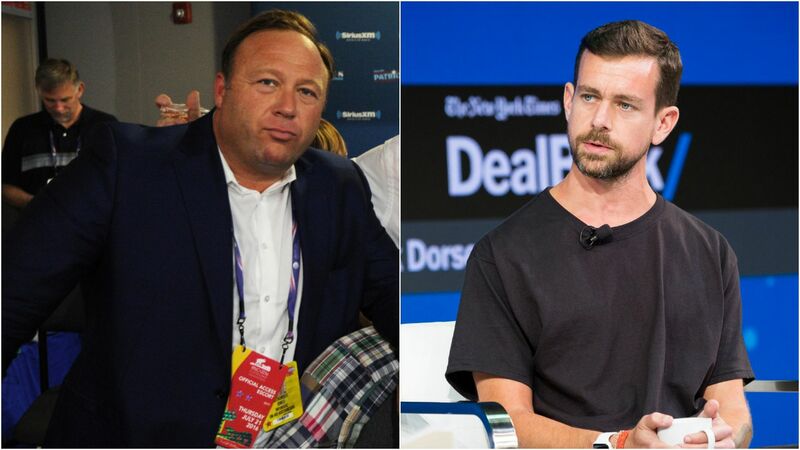 While other major tech companies such as YouTube, Facebook and Apple have taken action against conspiracy theorist and Infowars leader Alex Jones this week, Twitter has declined to do so, citing its commitment to protecting "the public conversation." The big picture: Several journalists immediately lashed out against Twitter CEO Jack Dorsey, saying Jones — who has said that the Sandy Hook shooting was a hoax — is purposefully spreading harmful falsehoods, and shouldn't be protected by the site. "We didn’t suspend Alex Jones or Infowars yesterday. We know that’s hard for many but the reason is simple: he hasn’t violated our rules. We’ll enforce if he does. ... We’re going to hold Jones to the same standard we hold to every account, not taking one-off actions to make us feel good in the short term, and adding fuel to new conspiracy theories. If we succumb and simply react to outside pressure, rather than straightforward principles we enforce (and evolve) impartially regardless of political viewpoints, we become a service that’s constructed by our personal views that can swing in any direction. That’s not us."